Ground Penetrating Radar Systems, LLC. 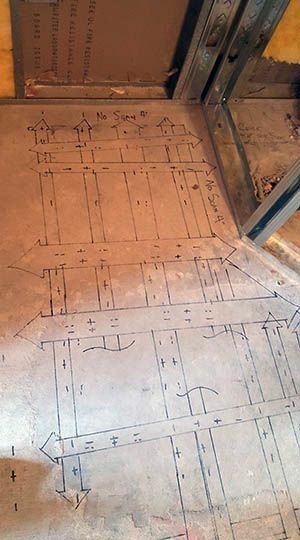 of Colorado was recently contacted by a local contractor to locate reinforcement and other anomalies in a concrete slab at a condo in Copper Mountain, CO. The customer was trying to drill several holes in a concrete slab to install new plumbing lines for renovations to the bathroom. The customer was looking to avoid striking any reinforcement or conduit in the slab, jeopardizing the structural integrity of the building or causing costly repairs. GPRS, LLC. arrived on site to provide sonar imaging (Ground Penetrating Radar) for the customer keeping the project on schedule without repairs or any other possible problems. Ground Penetrating Radar was ideal on this site as it was an active facility with many people on site staying in their own units. GPR does not require evacuation as with traditional x-ray. Ground Penetrating Radar emits no radiation and is completely safe to be around. Traditional x-ray is mostly done after hours; GPR can be done during normal business hours. All data findings are marked directly on the surface at the customer’s request for the easiest interpretation of the scanning provided, with GPR there is no wait for developing films as with traditional x-ray. Only one side of the slab is needed for scanning so time and resources are much more ideal for tight schedules of projects. Ground Penetrating Radar is the new way to x-ray! Ground Penetrating Radar Systems, LLC. specializes in GPR service and is our primary source of revenue. With that in mind, the amount of experience and specialization of concrete imaging and investigations as well as a nationwide network of technicians; GPRS, LLC. is unrivaled in the industry. GPRS, LLC. can supply your project with the safest and most accurate ground penetrating radar service in the business. Your safety is our main goal at Ground Penetrating Radar Systems, LLC. We are the experts in GPR. If you are interested in learning more about our sonar imaging capabilities or other Ground Penetrating Radar applications such as locating Utilities and sub-surface anomalies along a proposed pipeline trench, locating Underground Storage Tanks (USTs), clearing boring locations of possible Utilities for soil samples, Void Detection or even structural investigations. Don’t hesitate to contact us for a demo or lunch and learn – let us buy your team lunch so we can tell you more about our company and what we can offer your company and projects. Ground Penetrating Radar Systems has an office local in Denver, CO serving all of Colorado and Wyoming, as well as offices in nearly every major city in the United States. Contact Adam Rock at (303) 775-8270 or adam.rock@gprsinc.com today to schedule an appointment or free demo.